Day 4, and the last day before we swing the store doors open on October releases! What a gorgeous little set! Watercolor them, emboss them, or just stamp as an outline, and you will have a card any friend or family member will love! Our other Designers that are featuring samples on their blogs for Winged Whispers are: Kim, Katie, Linda, Tricia, Nancy, Sarah, Candy and Laurie (links on left sidebar). These are the last two for your collection! You now have January through December and you can start creating marvelous calendars, gardening books, and much more for all the flower lovers in your life! Our other Designers that are featuring samples on their blogs for Carnation - January Flower of the Month are: Katie, Sarah, Candy and Laurie (links on left sidebar). Our other Designers that are featuring samples on their blogs for Pansy - February Flower of the Month are: Angela, Cassie, Candy and Laurie. (links on left sidebar). Ok, I'll be honest, I am not a rooster fan, but this is a must have stamp for me! I just think he is the cutest little critter! I think you will agree! Our other Designers that are featuring samples on their blogs for Rooster are: Angela, Katie, Nancy, Cassie, Candy and Laurie. (links on left sidebar). More little word stamps for you to add to your collection! Our other Designer featuring samples on her blog for Individual Word Stamps is: Katie. (links on left sidebar). Tomorrow is the big day! We'll see you then! Day 3 of September sneak peeks! Day three of sneak peeks are here! Isn't this just the cutest little set! My daughter is going to go nuts over this set.....and you won't want to miss out next month to see what accessories might be coming for this cute little canine! Our other Designers that are featuring samples on their blogs for Dog Days are: Kim, Angela, Katie, Linda A., Tricia, Nancy and Candy. (links on left sidebar). This is another customer request....planes, planes, and more planes! We hope you like them! Our other Designers that are featuring samples on their blogs for Flying By are: Trudy, Katie, Linda A., Sarah and Candy. (links on left sidebar). Our other Designers that are featuring samples on their blogs for Glory Days are: Katie, Sarah, Stacy, Candy and Laurie. (links on left sidebar). You do not want to miss out on this adorable little cowboy set! You have to take a look at all the samples.....simply adorable! Wouldn't this be a cute party set? Our other Designers that are featuring samples on their blogs for Howdy Partners are: Angela, Linda A., Nancy, Sarah, Candy and Laurie. (links on left sidebar). A stamp set by our guest Illustrator: Derrick Schaffer. I have known Derrick since he was four or five! Derrick just turned 16 and is the son of Lorie Lee, our very excellent customer service person here at Clear Dollar Stamps! He has always been very talented at art....so we gave him a try.....I think his set ROCKS! Our other Designers that are featuring samples on their blogs for Rock On are: Kim, Angela, Trudy, Katie, Sarah, Cassie, Stacy, Candy and Laurie. (links on left sidebar). See you tomorrow for more great sneak peeks! Are you ready for day two of October sneak peeks.....then let's get started! I can think of plenty of uses for this set, can't you? I just love the sticks of butter with the sentiment "buttering you up"! I can think of a lot of times I could use that card! The samples for this set are just adorable! Our other Designers that are featuring samples on their blogs for this stamp set are: Kim, Angela, Katie, Sarah, Stacy, Laurie (links on left sidebar). This is another customer request! More card insides or focal words for the front....I hope you enjoy! Our other Designers that are featuring samples on their blogs for this stamp set are: Kim, Angela, Katie, Linda Anderson, Stacy (links on left sidebar). Our other Designers that are featuring samples on their blogs for this stamp set are: Trudy, Tricia, Cassie, Laurie, and Nancy (links on left sidebar). We have needed a nutcracker set for some time, and it has been requested many times. I think Laurie did a beautiful job on this set! The samples are gorgeous and the possibilities with this set are endless! Our other Designers that are featuring samples on their blogs for this stamp set are: Kim, Trudy, Katie, Tricia, Cassie, Stacy, Laurie (links on left sidebar). Our value verses are sold at 20% off retail every day! Our other Designers that are featuring samples on their blogs for this stamp set are: Angela, Linda Anderson, Tricia, Stacy, Laurie (links on left sidebar). Meet us here tomorrow for day three of sneak peeks! Remember all of these are available on October 1st! New stamps are coming, once again, at Clear Dollar Stamps! Fall is just the perfect time to start working on all your Christmas projects and getting caught up on your scrapbooking! Make sure to check out Katie's tutorials every week....you are sure to get some great ideas! We are so excited to announce our new Illustrator, Wendy Hall! You are just going to love her adorable Illustrations! My name is Wendy Hall (more often than not know as Louby Loo in the Stamping world). I was born and bred in bonny Scotland but have lived in the United States for the past ten years. I have been creating and illustrating for as long as I can remember. I am a trained graphic artist, but spent a big part of my life using these skills in a more technical aspect. I am delighted that I can now spend time creating what I love. It bring me so much joy to create these illustrations and be able to share them with you. Her first design for Clear Dollar Stamps is Billy and Maggie Fall fun! We have had so many requests from all of our loyal customers for cute little kid stamps.....and we think we have found just what you are looking for! Our other Designers that are featuring samples on their blogs for this set: Wendy, Stacy, Katie, and Laurie (links on left sidebar). Oh my goodness! Is this simply the cutest scarecrow you have seen! Shawne added kitties and pumpkins, to make the cutest set! Just perfect for fall scrap pages, cards, and projects for your kid's classes! Our other Designers that are featuring samples on their blogs for this set: Kim, Trudy, Tricia, Sarah, Cassie, Stacy, Laurie (links on left sidebar). I thought this would be the most lovely table place card at a Thanksgiving table! I am so thankful to God for everything he has done and does for me every day! Our other Designers that are featuring samples on their blogs for this set: Kim, Tricia, Nancy, Sarah, Cassie (links on left sidebar). Simple, yet elegant, this set will make adorable and quick cards and projects! You do not want to miss out on this set! Our other Designers that are featuring samples on their blogs for this set: Angela, Katie, Linda Anderson, Tricia, Nancy, Candy, Laurie (links on left sidebar). We have a guest Illustrator this month: Heather Rolin! Heather sent me these little turkeys and they were just too cute to resist....and I thought you would think so too! A hunter turkey, a jazzer-turkey, and a stuffed turkey.....how perfect for so many cards and projects! Our other Designers that are featuring samples on their blogs for this set: Kim, Angela, Trudy, Cassie, Stacy, Laurie (links on left sidebar). See you here tomorrow for more great sneak peeks! Hi friends, its Katie here closing out another week with you. Don't the days seem to fly by? Well, today I want to focus on one of those products that are fun to use, but you might not use them all the time. If you didn't know this already, many people use mulberry paper to create things like tear animals, but mostly tear bears. I do not have this skill, but I do love the "organic" look of mulberry paper and I think it adds a different look to your cards, so my goal is to incorporate it into my card making. For today's tutorial I tried a couple of things that I hadn't ever done before with mulberry paper. I stamped, embossed, and colored right onto my mulberry paper. One of the unique things about mulberry paper is the way that it works with water, kind of a yin/yang thing going on with it. Water allows it to tear so easily but on the other hand water doesn't disintegrate it either. You'll see what I mean as you go along. I decided that the mulberry paper was going to be my main canvas, but I wanted some color and interest to it so I decided to do my stamping directly on it. As I mentioned earlier, water is remarkable when it comes to mulberry paper. I decided that I wanted a somewhat diagonal version with 1/2 representing greenery and the other half representing the ocean. All I did was take my waterbrush or also referred to as an aqua painter and "draw" my line. After the wet line is drawn, its super easy to separate and the tear will fall right where your water line is. If there are some of the larger/thicker fibers in there just use a pair of scissors to cut it or as I did just pull it a bit and it will pull from the side with the least resistance. Next it is time to color/stamp my pieces. I decided to spritz my pieces because I wanted my color and my images to spread. The mulberry paper can get very wet without tearing even though it can tear quite easily... get the dichotomy here? This particular section is going to be my ocean so I used a sponge and my dye ink pad and sponged on some blue. You could set the mulberry paper aside to dry, but you can also use your heat gun to make the process faster. Now its time to put the background together. I placed my mulberry pieces onto a piece of white cardstock and attached them with just a little bit of adhesive in the centers because I am going to do some stitching with this one. Pull threads to the back and just tape down. I then took my brush and wet my mulberry edges and gently tore the edges. You can see where I've already torn above my brush. Here's a close up... if there is too much resistance just add more water. Now for my main stamped image. I decided to emboss and it worked fabulous on the mulberry. I also decided to use some Copics too... you must have a light touch due to the absorbency of the mulberry, but you can't be too finicky either. The fun part of coloring is the way the color spreads and blends. I also used the waterbrush and my ink pad to add other color. The blues on the mane of my seahorse was colored with Copics, the rest of my seahorse was colored with ink and the waterbrush. You can also use other markers to color as well. Remember to put something under your mulberry paper because colors do soak through. So here is my card base. I decided to add some twine before adding my main image. Here's a close up of the mulberry paper. Thanks for hanging here with us at Clearly iStamp and have a great Friday and a continued wonderful weekend. Hi friends! Its Katie here to welcome you to another fabulous Tuesday. Its time to get your embossing powder and heat gun out again. I just love this technique, but I seriously have a soft spot for embossing! The process is so magical and the results are amazing. It always looks like a ton of stuff, but this is really quite simple. The star of the show of course is this fabulous little set called Art Deco Medallions. This is such a super versatile set and is really a must have. Let's get started. All you need is a piece of cardstock and to be honest, the color doesn't really matter since its going to be entirely coated with embossing powder. Take your Versamark ink pad and just brush it across your piece of cardstock. Just make sure that the surface covered is large enough for your stamp. Next just pour silver embossing powder on top of the inked area and tap off excess. Then use your heat gun and melt away. Then quickly pour more embossing powder on top... your first layer NEEDS TO BE STILL WARM. Use your heat gun and melt again. Repeat this one or two more times for a total of 3 or 4 layers. Your embossed area should look like the picture below... smooth. Make sure your stamp is ready to go on your block and you have space ready to go to stamp. You have to move quickly. As soon as the powder has melted, set your cardstock down and quickly and firmly stamp your image onto the embossing. Gently lift off. Next, take a 1 3/8" circle punch to cut out the image. And there is your embossed medallion. Just a little side note here... see that cheese clothy looking thing in the picture below? Well, that little thing is a glitter and/or embossing cloth that is fabulous. It works great. It is a Scor-pal product and Lori carries them at the store... when you get it, unfold, cut to desired size and just wipe your glittery surface. When it no longer picks ups just throw away and grab a new piece. You can get yours HERE. So now that I have these great medallions, I decided that they would make a great Christmas card. I continued on with love of embossing and decided to create strings for my Christmas ornaments, but this time I decided to use the Versamark embossing pen. I decided on some pretty paper from Cosmo Cricket... and another side note here... the paper is pretty, but one of the things that I do like about these mini decks is the extra space that they provide when tearing the sheets off... its the little things sometimes. Ok, so now for the fun stuff. I just took my embossing pen and a ruler and made a mark on my paper. Heat and melt... Here's a tip for you. I embossed on some thin paper and it did warp a bit afterwards. All I did was use a brayer to roll my paper smooth after I glued it to my cardstock. I positioned my medallions so I would know where to draw my next line. Before I attached my ornaments I tied ribbons and then just attached them at the very top of my ornaments with a tiny glue dot. Then I used more glue dots to attach my ornaments to my card front. And then I added just a bit of glam with the Basic Grey Bling It right into the center of my ornaments. That's it for me today and I hope you have a wonderful Tuesday! This is Katie signing off fro Clearly iStamp. Hi friends...its Katie here and I want to wish you a happy Friday. Today, I've got another favorite recipe of mine to share with you and a great way to present it. For today's example, I used my gift as a house warming or hostess type of goody, but this recipe and presentation would be awesome as a holiday gift too. Let me start with the recipe. In a bowl mix all ingredients except 1/2 cup powdered sugar. Use mixer then gather into a ball. Regrigerate for 1 hour. Roll into 1" balls, bake at 350 for 15 minutes. Roll in powdered sugar while cookies are still warm. Roll again when cool. Mix until it starts forming into a ball in the mixing bowl. You could make them even smaller than these since they turned out (for me) as a 2 or even 3 biter. Now for my 9 year old son... they are a one large mouthful. Here's what they look like after baking. I went the full 15 minutes and I could have probably gotten a minute or two less, but they still turned out great. Now time to roll in the powdered sugar. I always roll twice if not 3 times and definitely get your first coat on while the cookies are still slightly warm... AND... the left over 1/2 cup of powdered sugar is never enough for me. I just keep the bag handy and add as much as I want. Now, you need a great container. I had originally planned on altering a plastic container that I had, but it just didn't work... trust me you don't want the details. Well lucky for me I had these on hand. I used my last one so I'll have to grab some more. Lori carries a good variety of plastic boxes that come to you just like this - nice and flat. The box measures 3 1/2" x 3 1/2" and I decided to cut strips to attach to all 4 sides. I really wanted most of the box to show so the cookies would be very visible. I grabbed a spare coaster and cut it just smaller than 3 1/2" square and then wrapped it with wax paper. This I placed on the bottom of my clear box. Now just fill with cookies and finish decorating. I managed to fit in 26 cookies. I used a newer set called Nice Neighborhood... love these house images. I used these Copics (BG72,R59,E37,C-3,BG93) just colored 2 layers and that was it. Well that's it for me and I hope you enjoy the rest of your day and have a great weekend. Today's tutorial is a box that is a card or whatever else you might want to use it for. I've made many of these over the years and they are super cute. Another project where the sky's the limit. The two stamp sets that I am using for this project are Words of Gratitude and Art Deco Medallions. This project also has some fun random stamping as well as some fun designer paper. I pretty much went from my designer paper to pick my ink colors. You will need 2 main pieces of cardstock. The actual box measures 7 1/2" x 7 1/2" and the lid measures 4 3/8" x 4 3/8". I decided to random stamp before creating the score marks. If you want a bit more detail about the process of random stamping, CLICK HERE. I started with my largest image first and picked the medium shade. Next I picked the middle size stamp and picked the lightest shade of ink for this image. And finally picked the smallest stamp and picked my darkest ink for that one. Now its time to score. Easy... just score 2 1/2" all the way around. Flip your cardstock over to create creases for your corners. I flipped the cardstock because these creases are going in the opposite direction of the main box. Just make sure that when you are scoring your corners that the corners are aligned. Do all 4 corners. Next, I cut the corners off and this just creates a nice fold for inside the box. You don't have to make a pencil line, just cut from score mark to score mark. Now just fold up on those corners. And there is your box. Now its time to make your pockets on the inside. The pocket base needs to measure at least 2 1/8" wide by 12" before your use the edge punch. Of course I had to make my measurements a little small so I thought I'd show you exactly where it is on my Fiskars cutter. So cut your scalloped cardstock in 2 5/16" sections. Then cut your designer paper (Marakech - Basic Grey) to 1 3/8" x 2 3/16"
I used the 1/8" scor tape and placed it on 3 sides of the designer paper. Make sure it is flush with the very edge, but the pieces don't have to cover all of it. Grab whatever sentiment you want to use and stamp on a piece of cardstock measuring 2" x 2". The mat for this stamped piece is going to measure 2 1/4" x 2 1/4" ( in this case I used the blue). Once its all put together, I used pop dots and then attached to the center of the box. Here is the box with the pockets and the center attached. The tags that I created were made with a 1 1/4" circle punch and the scallop border is a 1 1/2" punch. Just glue together and then use a hole punch to create the holes. I left these blank, but you could hand write whatever sentiment, stamp an image, whatever you want. Now its time to create the lid. Remember... 4 3/8" x 4 3/8". Score at 7/8" on all 4 sides. I love my scor-pal but there are times that a stylus and the Fiskars works perfectly! I used more scor tape and added it to 3 sides of my lid. I did this to keep my ribbon in place. I cut 24" of ribbon, found the center and matched that up to what is going to be the back of my lid. Then tie in a bow on the front. Here is the outside of the box. There you go! I hope you enjoyed it and I certainly hope that you have a wonderful Tuesday and as always, thanks for joining me! We have decided that in order to keep things FRESH, we want to change things up a little, for the better! Our Guest Designer Challenge, which has been extremely popular, is going to be tucked up on a shelf for a while and we are going to introduce our new program, Featured Friends! 1. We will scout the internet via popular stamping forums and galleries, our color challenge group over at PCP, and blog visits/comments here and on CDS design team blogs. 2. We will select ONE person to FEATURE each month on the 10th of every month. NO challenge entries, NO contests! 3. We look for creative individuals who are currently creating and posting with Clear Dollar Stamps images, and who are FRESH and FUN people! 4. The FEATURED FRIEND will receive ONE free stamp set of his/her choice from that months releases, as a gift! No samples required, but of course, if you are selected to be a CDS Featured Friend, we know that you will probably WANT to use your new stamps and show them off eventually! 5. 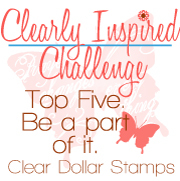 The FEATURED FRIEND will get a full blog post dedicated to featuring THEM, right here at Clearly iStamp. We will select some projects from his/her online gallery or blog and display them here along with making sure to link their blogs, galleries, and telling everyone HOW we found them, as well as telling everyone a little bit ABOUT them. 6. The Featured Friend will be notified via email approximately 2 weeks prior to the 10th to be informed that THEY are our selected Featured Friend, and will be asked to answer a few questions about themselves and their stamping life. So just keep on creating with CDStamps and posting on your blog and public galleries, and we WILL find you! Who knows.... YOU could be the next CDS FEATURED FRIEND right here! We found Terrica on SCS. She started making a Charlie the horse book and posting all the pages for that in her SCS gallery, as well as creating many more fabulous works of art using CDS stamps. I went to a SU workshop and was hooked in 1999. My husband was diagnosed with an inoperable brain tumor and I used stamping as a therapy to deal with everything. I like to make each creation for the individual person and put their personality in it. I only discovered CDS less than a year ago but the art was so great and the quality too that coupled with the low cost, I became a dedicated customer right away. It is hard to pick just one thing but I guess it is the samples of the cards that the great design team puts out, that reels me in and I end up with a huge wish list! I also like to scrapbook and cross-stitch. I spend a lot of money and time reading and listening to audio books as well. Here are some of Terrica's work using Clear Dollar Stamps below, and click HERE to see Terrica's SCS gallery. One of the many adorable Charlie pages in her Charlie book. This is the Charlie gardens page. Isn't this spaceship just too cute for words? She used the Lost in Space stamp set. I love the hanging stars across the top and she did a fabulous job on the coloring and sewing. Oh I just squealed at how darling this ballerina card is! Look at the precious sewing and that cute designer paper! She used the My Little Ballerina stamp set. What a pretty fall looking card she made using the Sunflower Songs! This was her entry for the September Guest Designer Challenge, and she did an awesome job at the challenge.